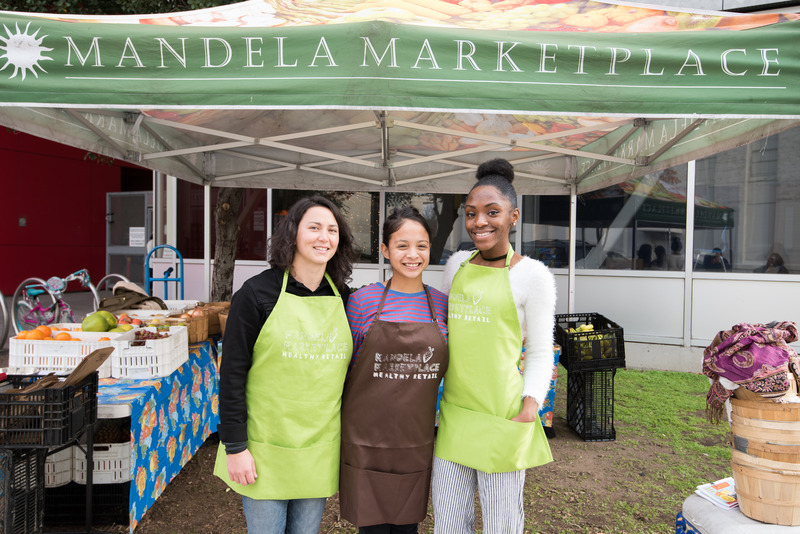 For over a decade, Mandela Marketplace has addressed the challenges of healthy food access and economic opportunity in West Oakland and low-income communities of color around the region. She was at the forefront of advocating and fundraising for the launch of a worker-owned cooperative grocery store, Mandela Foods Cooperative, that sells healthy foods to West Oakland residents who have been lacking a grocery store for decades. Committed to health and equity throughout the food system, Mandela Marketplace, also incubated Mandela Foods Distribution, to buy directly from small, local, under-resources farmers and supply fresh produce to the food coop, corner stores produce stands at over 20 locations in West and East Oakland. Building on these business incubation experiences, Mandela Marketplace continues to expand efforts to grow local healthy food businesses. Working with emerging entrepreneurs from chefs to small farmers, Harvey and her team soon realized many small-scale business owners could not access the capital they needed to grow. As Mariela Cedeño, Business Development and Director of Mandela Marketplace, states “When we first began supporting businesses to get loans, we realized that many of them would not make it through the underwriting, because it wasn’t structured to benefit them in a way that made financial sense.” Mandela Marketplace decided to become an intermediary lender in order to leverage the nonprofit’s grant funding to reduce risk and support these businesses. FreshWorks was a natural partner to provide capital having worked with Mandela to open the food cooperative in 2009. With a loan from FreshWorks through Capital Impact Partners, the Ladder Up Fund launched in 2015. “We felt really strongly that our own in-house loan fund could make a difference,” emphasized Cedeño. In the first two years of Ladder Up Financing, Mandela Marketplace has disbursed over $125,000, providing loans ranging from $1,500 to $34,000. Borrowers are required to use the funds to grow, expand, or convert to healthy food businesses to improve access in underserved communities. A unique aspect of Ladder Up loans is that they also serve as a wealth building tool. Once the loan is repaid and all conditions met, borrowers receive all of the 3.9% interest paid back as savings. As a community organization, Mandela Marketplace holds deep relationships with each business owner providing tailored technical assistance and flexibility. “We understand their business and they are transparent with us, which allows us to have a different relationship with them.” states Cedeño. For example, Mandela was able to restructure loans when farmers faced flooding and loss of crops. “As a nonprofit we can mitigate their risk even more because of our close relationships,“explains Cedeño. She adds, “We are building a model of proof that folks who are considered risky by traditional finance, are not. Loans are just not structured to benefit them.” The depth of their relationships with businesses and the ability to be flexible has paid off, with the fund being incredibly successful and accruing 100% repayment on all loans. In 2018, Mandela Marketplace’s success in improving the local food landscape will continue to grow with the expansion of Mandela Foods Cooperative into a larger space. The cooperative grocery store will occupy the 20,000 sqft space recently vacated by a 99 Cents Only store a block away on the corner of 7th Street and Mandela Parkway. A significant upgrade from the current 8,000-sq.ft. space, the new space will allow Mandela Foods Cooperative to provide a full grocery store experience while growing jobs with pathways to ownership for community members. Building on Mandela’s work with entrepreneurs, the new market will also have kiosks and stands for small business owners to open a juice bar or flower stall inside the store. A community wellness center and pharmacy will also operate onsite through a partnership with West Oakland Health Clinic.